Designed for backpackers who need a tent that can do it all while still being compact and lightweight, MSR's bestselling Hubba Hubba NX 2 person tent feels as light and efficient to use as it does to carry. From its spacious interior to its quick setup, this tent redefines lightweight livability. Designed for backpackers who need a tent that can do it all while still being compact and lightweight, MSR &apos;s bestselling Hubba Hubba NX 2 person tent feels as light and efficient to use as it does to carry. 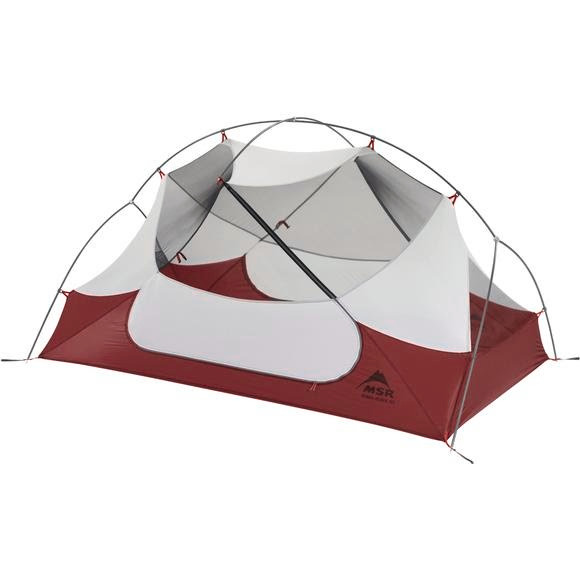 From its spacious interior to its quick setup, this tent redefines lightweight livability. And now it boasts premier durability features, including virtually indestructible Easton® Syclone™ poles and MSR&apos;s long lasting Xtreme Shield™ waterproof coating. Whether you&apos;re setting out to climb the Sawatch Range or circumnavigate Mount Rainier along the Wonderland Trail, the freestanding, 3-season Hubba Hubba NX tent lets you enjoy the full backcountry experience, including time spent in the tent. Ultra-durable coating is formulated to resist fabric stickiness (hydrolysis), lasting up to 3 times longer than standard waterproof coatings. Cutting-edge aerospace composite materials make poles virtually indestructible in challenging and windy conditions.